The catalogue published in EMLO this week — a calendar of the correspondence of the late-sixteenth century printer Christophe Plantin — is symbolic on a number of levels. Self educated and with little by way of privilege or influential contacts behind him, Plantin made his way from France to Antwerp, where he set up his printing press and worked to develop a business, the Officina Plantiniana, that expanded to become the largest typographical firm in Europe. Plantin was talented. In decades that experienced exceptional political and religious turmoil in the Spanish Netherlands, he negotiated successfully to publish works by both Protestants and Catholics alike. With judicious foresight, he opened and maintained (alongside his headquarters in Antwerp) offices in Leiden and Paris, and he developed a publishing empire that was able to continue seamlessly under the direction of his sons-in-law after his death. Indeed, the descendants of Jan Moretus, who ran the Antwerp branch, continued in business until the second half of the nineteenth century. This calendar of his correspondence has been created from the invaluable nine volumes edited by Max Rooses (of Corpus Diplomaticus Rubenianum fame, on which EMLO’s Rubens catalogue is based) and Jan Denucé. These two editors were consecutive curators at the Museum Plantin-Moretus, in Antwerp, where the family’s and firm’s archive is housed. The catalogue in EMLO is a collaborative work, and I’m proud to say that a large number of Digital Fellows (amongst whom number postgraduate and undergraduate students, librarians, editors, translators, and interns), as well as scholars visiting the Cultures of Knowledge project and work experience students, have rolled up their collective sleeves to enter this metadata as part of their initial training with the union catalogue. It has been a joy to be involved with Plantin’s catalogue and to see this calendar of his letters come into being, and all involved deserve tremendous credit. Plantin’s letters afford an extraordinarily detailed insight into the workings of an early modern printing house, including its day-to-day business and pan-European negotiations. They provide, furthermore, an example of a man who found a way to succeed against the backdrop of military intervention and the religious and political struggles that became the hallmark of his age. 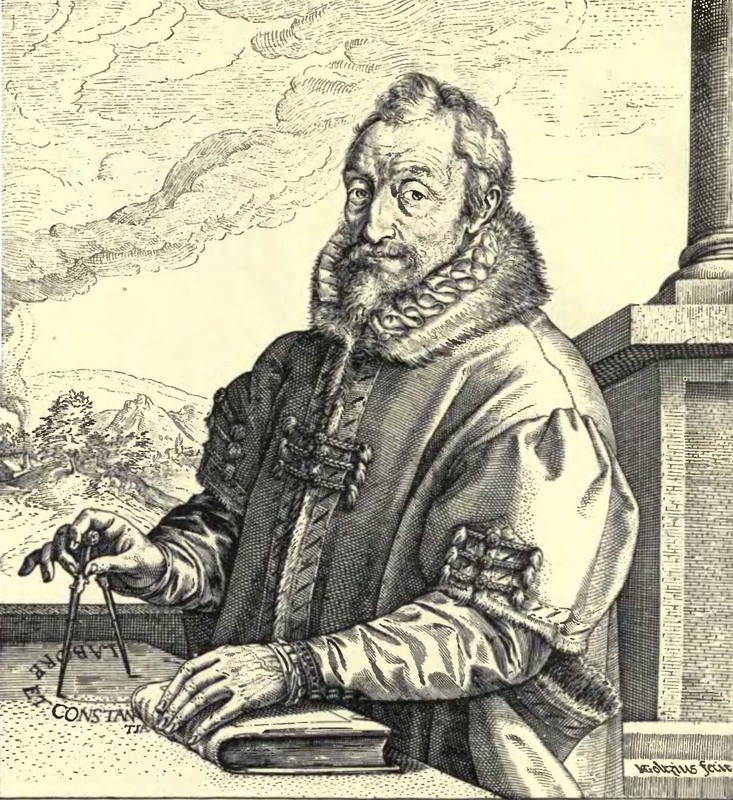 Antwerp was an important centre of humanism, and Plantin corresponded with many leading individuals, including the renowned scholar Justus Lipsius, whose oeuvre the press printed. The two men were close friends, and Plantin kept a room where Lipsius could live as he worked to correct his proofs. Known now as the ‘Justus Lipsiuskamer’ or ‘chambre Lipsius‘, this may be visited at the Museum Plantin-Moretus. In today’s times of trouble, Plantin’s letters provide reassurance that it is possible for scholars, publishers, editors, technicians, and librarians from across Europe to come together, just as we do at present through the COST Action ‘Reassembling the Republic of Letters’ to study and discuss the intricate networks of our early modern individuals whose correspondences transcended many boundaries. This twenty-first century community is emerging as an electronic republic in its own right, and there is a satisfying symmetry to be found in the echo of the principles that underpin the correspondences of those whose lives and interconnections we work with such painstaking care to reassemble. This week’s publication in the union catalogue contains at its heart a glimmer of hope that we are able to draw together as partners, as well as proof that we work to share our developments, our workflows, and our standards. It demonstrates how we are able to unite and, here at EMLO, we are truly delighted to announce that thanks to a collaboration with, and the generosity of, the scholar and editor Dr Jeanine de Landtsheer Christophe Plantin’s catalogue is to be followed very shortly by one for his valued friend, none other than the humanist Justus Lipsius. This entry was posted in Uncategorized on June 27, 2016 by Miranda Lewis. In a week during which the editing of scholarly correspondence rises to the fore in Oxford, EMLO is delighted to announce publication of a catalogue of the correspondence of Richard Thomson. Best known as a translator of the Bible and as an early Arminian, ‘Dutch’ Thomson (as he tends to be known) was admired widely during his lifetime for his learning and scholarship. 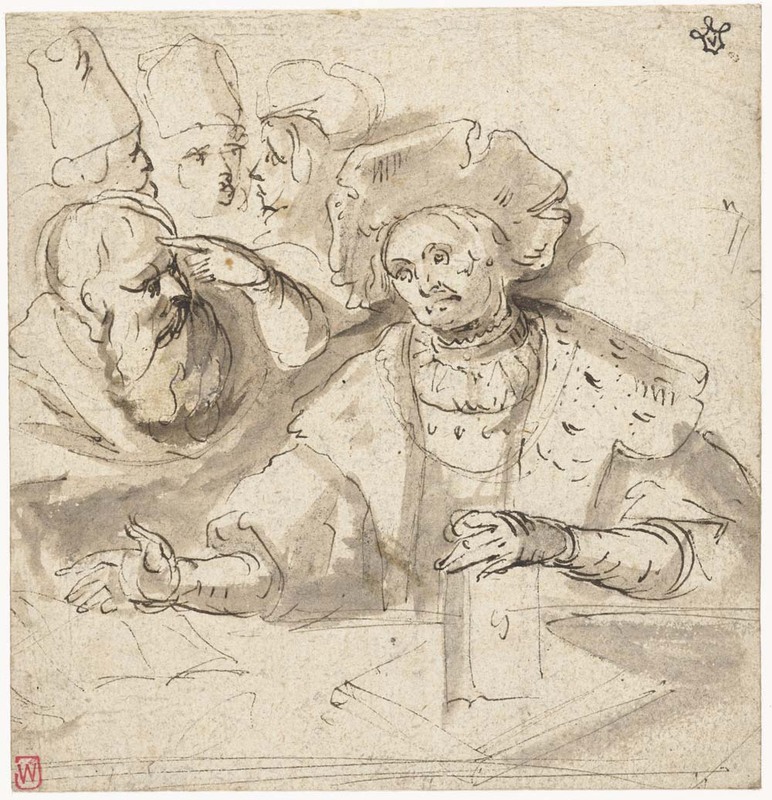 Active in the decades surrounding 1600 — he died in 1613 — he was a correspondent and friend of both Joseph Justus Scaliger and Isaac Casaubon, and he travelled extensively to work with manuscripts in Europe’s great early modern libraries. 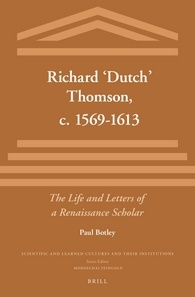 Earlier this year, the first biography of Thomson, written by Paul Botley (one of the editors of the impressive eight-volume Scaliger edition brought out by Librarie Droz in 2012) was published by Brill together with Thomson’s surviving correspondence of seventy-eight letters. Dr Botley has contributed a calendar of the correspondence to EMLO where it joins the catalogue of Scaliger’s correspondence and will, in the years to come, sit alongside that of Casaubon. Correspondence editions are the focus of a one-day student-organized conference to be held in the Bodleian’s new Weston Library tomorrow (Tuesday, 21 June). Entitled Speaking in Absence: Letters in the Digital Age, the conference includes discussions between intellectual historians (including our own Project Director, Howard Hotson) and scholarly editors, presentations by curators of the Bodleian’s Special Collections, and a panel session bringing together representatives from Oxford University Press and Blackwell’s bookshop. Should you be interested in attending, a full schedule and details regarding registration may be found here. EMLO will be present and I look forward greatly to recreating the journey metadata takes from a manuscript in the Bodleian’s Special Collections all the way through to our rapidly expanding catalogue of correspondence as we try to define and map the shape and constituent parts of the ‘respublica litteraria’. This entry was posted in Uncategorized on June 20, 2016 by Miranda Lewis. This week in EMLO we turn our attention to philosophy with publication of the catalogue of the correspondence of Henricus Reneri. A Calvinist convert who had fled from Liège, Reneri was working as a tutor in Amsterdam when he met René Descartes for the first time. It was the winter of 1628–9 and the two became such firm — and lifelong — friends that when, in 1631, Reneri was appointed professor of philosophy at the Deventer Illustre Gymnasium and, subsequently in 1634, at the school in Utrecht, Descartes chose to move as well. By 1638, Reneri was teaching and promoting Decartes’s philosophy openly, and he encouraged Descartes to write and to publish. The calendar of Reneri’s surviving correspondence has been contributed to EMLO by Dr Robin Buning, who worked with Cultures of Knowledge on the correspondence networks of Samuel Hartlib for three fruitful years. Prior to that, during his doctoral studies, Robin collated and worked on Reneri’s surviving correspondence and his thesis, supervised by Professor Theo Verbeek at Utrecht, formed part of the project ‘Descartes and his network‘, the main output of which is a forthcoming and eagerly awaited new edition of Descartes’s complete correspondence. Despite his friendship with, and promotion of, Descartes, Reneri himself is not considered a Cartesian philosopher, teaching instead a reformed Aristotelianism which combined Aristotle’s physics with elements from Descartes’s theories. Of course, Descartes’s own correspondence — contributed to our union catalogue by Cultures of Knowledge’s Dutch sister project, Circulation of Knowledge and its text-rich database the ePistolarium, and taken from the edition of Charles Adam and Gérard Milhaud (which was published between 1936 and 1963) — may be consulted also in EMLO. Reneri, who conducted his own experiments with thermometers, optics, and water clocks, was known within the circle of Samuel Hartlib, and he provides a fascinating example of how an individual may be traced in and out of correspondence clusters, stitching threads across EMLO’s union catalogue in the course of a scholarly life. With regard to twenty-first century scholarly networks, Robin is working at present on the formidable and impressive Erasmus Opera Omnia edition and we hope very much it will not be too long before we work together again. This entry was posted in Uncategorized on June 11, 2016 by Miranda Lewis.